I am quite familiar with the Fulton Mall: in fact I have walked Fulton Street in its entirety from the East River waterfront to East New York. 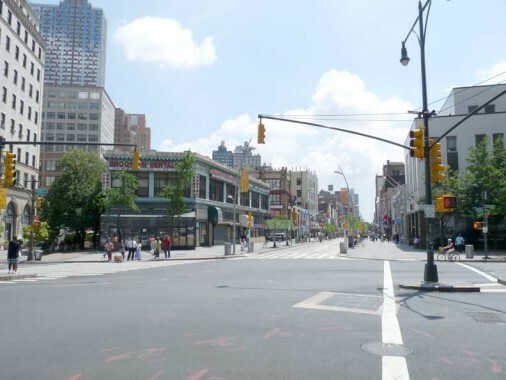 While NYC Department of Transportation traffic-calmer Janette Sadik-Khan was still a teenager in 1979, Fulton Street between Adams Street and Flatbush Avenue banned cars, only allowing buses and delivery vehicles (of course, they didn’t go all the way and make it a pedestrian path). 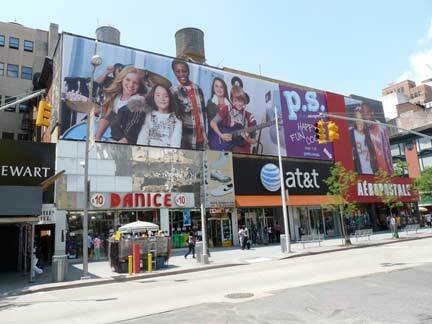 The street received a set of unique 1970s-era signage, lampposts, and bus shelters that had, by the 2000s, gotten fairly shopworn and dated (seen here on this page I did of the shopping strip in 2004). 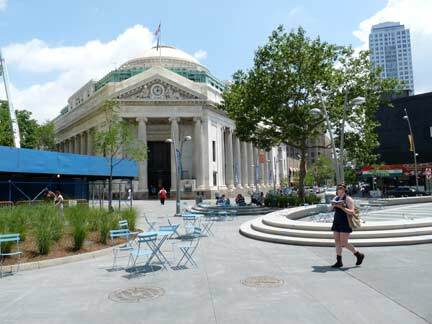 In 2009 a $15 million dollar remake of Fulton Mall was announced by the Fulton Mall Improvement Association, and it was largely finished by mid-2011. 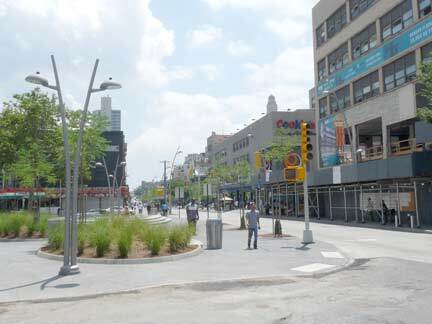 The first thing that struck me about the changes was the addition of curved giant lampposts that look like they were transported from the pages of H.g. Wells’ Things to Come. I like them, nonetheless. Though elsewhere the city is installing new versions of the usual octagonal-shaft posts first instituted in 1950 (pushing out the innovative Donald Deskey posts first seen in 1958 and spreading like wildfire between 1962 and 1972) I applaud efforts to move toward a new lamppost standard in the 20th Century. The new curved posts removed giant 30-foot tall spotlight poles, which I thought to be somewhat extreme for a shopping mall. 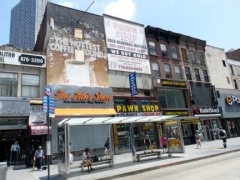 Elsewhere, the big boxy bus shelters (with the exposed light bulbs on the outsides) have been removed in favor of the new glassy CEMUSA models, while the beige signs with Helvetica type font have been removed in favor of regulation green and white signage, most of them upper and lower case to conform to new Federal regulations. Historical plaques have been placed at intervals, though we’ll have to see how these stand up to vandalism and graffiti paint sprayers. 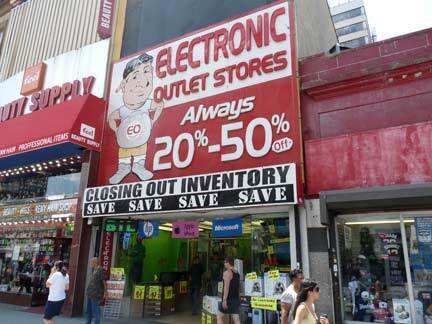 The portal to the Fulton Mall. City map makers atre fond of bestowing new names on familiar routes, to please one interest group or the other. Adams Street, in the foreground, was been given the honorific Brooklyn Bridge Boulevard; north of here, Fulton Street has become Cadman Plaza west and Old Fulton Street near the East River; and east of here, Fulton Street is called Fulton Mall for a few blocks, and subtitled Harriet Tubman Avenue, for the Underground Railroad heroine, for its entire length. Willoughby Street trails off on the left, and a 1979 Fulton Mall survivor, a straight shafted L-shaped traffic light, is there too. Helpful directional maps have been added, including the locations of several neighborhood highlights and surrounding areas. 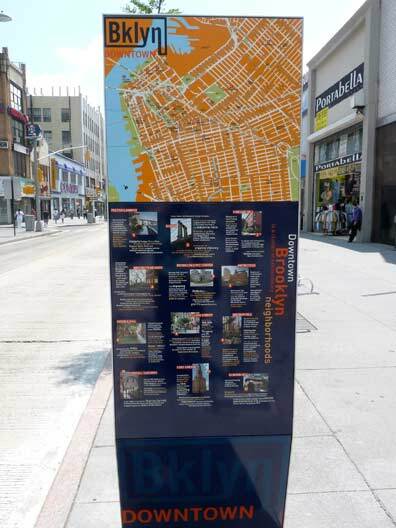 This one designates the old Fulton Street ferry landing, DUMBO, Cobble Hill, Brooklyn Heights, Vinegar Hill, MetroTech, Boerum Hill, Fort Greene and Clinton Hill. 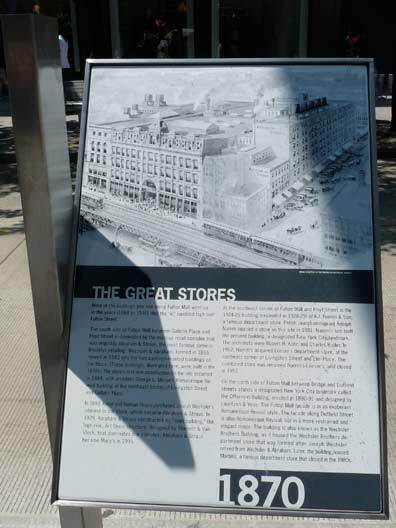 The historical plaque takes you back to Fulton Street in the early 1800s, before the coming of the grand department stores after the Brooklyn Bridge opened in 1883. Fulton Street was formerly lined with mansions and private homes. Ancient burial grounds lie beneath the concrete and the traffic. Later, elegant town houses — many of which still stand in shockingly debased fashion — were built along the street. 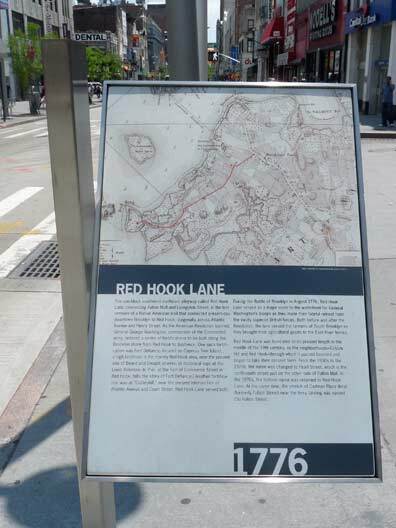 In 2004, plans were floated for the elimination of historic, colonial-era Red Hook Lane, which runs for a diagonal block from Fulton to Adams and Livingston. So, I prepared anelegiac Forgotten page of lament. 7 years later, though, the ancient track that once ran southwest to Red Hook is still surviving, the recession apparently having beaten back the office tower that was going to be built. The Mall planners have added a historical sign commemorating its history. 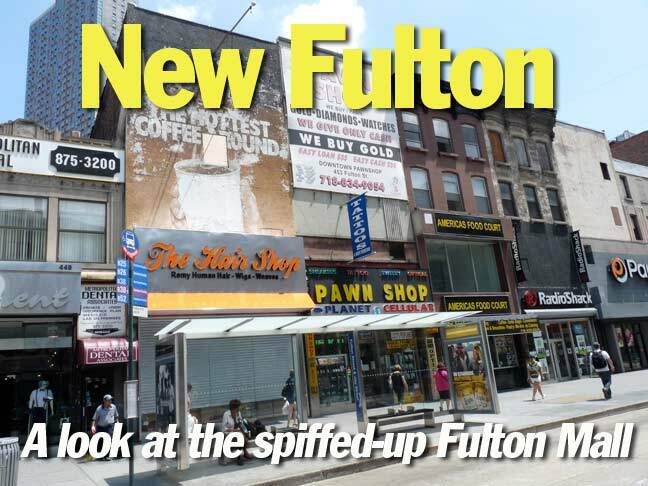 Grand schemes and plans are always being hatched about how to make Fulton, and its parallel routes Willoughby and Livingston Street, more upscale, now that huge residential towers with million dollar apartents are being built nearby. Meanwhile, the borough of Brooklyn continues to head to Fulton Street for affordable merchandise. 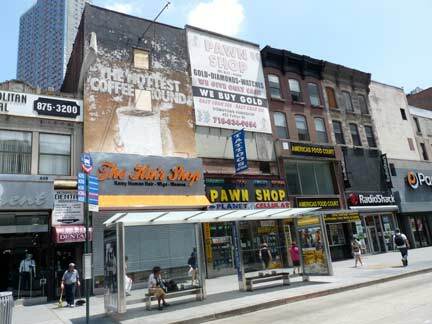 On the right, several storefronts occupy what were once residential townhouses. 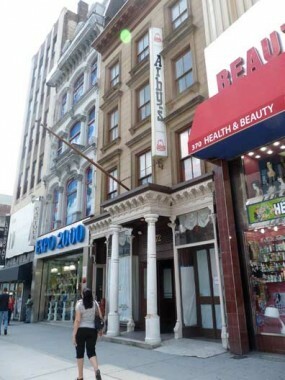 Since longtime seafood restaurant Gage & Tollner left 373 Fulton Street (west of Smith) in 2004 (fortunately its landmarked interior with gaslamps, polished cherry and mahogany wood tables and chairs, and mirrors remains intact) a series of fast food places such as Fridays and Arbys have tried and failed to fill its old shoes. 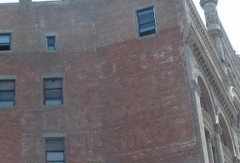 The building was constructed in 1875 and the venerable restaurant moved in in 1892. When the signage on the Fulton Mall was replaced, Gallatin Place was apparently promoted to Street. By the time my parents started bringing me around to A&S in the 1960s for jackets, shirts and pants (their other supplier was Robert Hall, which was in Bay Ridge) its competitors such as Oppenheim Collins, Loeser’s and Namm’s had vanished from the scene, with discounters like Marshall’s taking over. 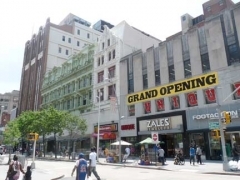 I still think of the store as Abraham and Straus, even though the rapacious Macy’s (the World’s Biggest Store) took over its amalgamation of buildings at Fulton and Bridge Streets in 1995. 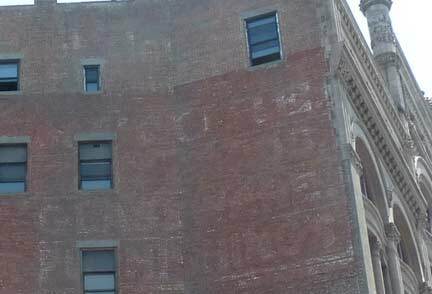 One of Fulton’s grandest old piles is the Offerman Building, which can be seen dramatically from Hoyt Street, a Romanesque Revival built in 1891 (this was home to Marshall’s for many years). 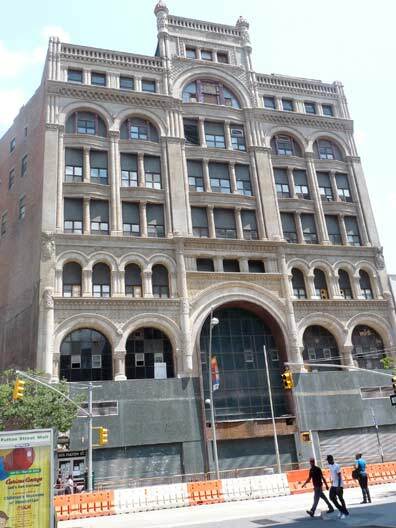 In its classic era, it housed the Wechsler Brothers Department store, named for the former partners of Abraham Abraham, who founded A&S. 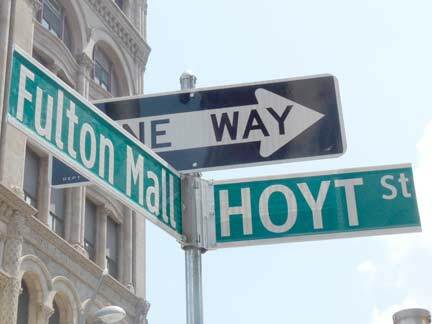 Yet one more signage error at Fulton Mall: HOYT Street in all caps, with “St.” in lowercase. 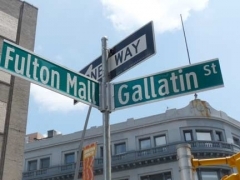 The whole point of the Federal directive was to make street signs more readable by setting them in lower case type, so what they did here was replace capitals with capitals in a different font. 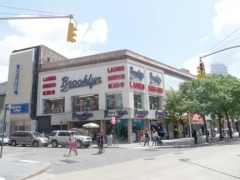 At Duffield Street, a store called Brooklyn USA sports a sign with lettering remarkably like the “Brooklyn” script on the old Brooklyn Dodgers road uniforms. Surprising, since the Dodgers have been pettily litigious about their logo over the years, suing a Bay Ridge tavern called the Brooklyn Dodger into changing its name to the Salty Dog. 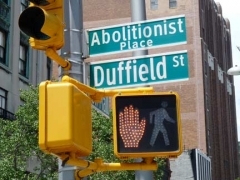 Duffield Street has been given the sobriquet “Abolitionist Place” as a number of 18th Century dwellings along its length are thought to have been staging areas for the Underground Railroad, in which escaped slaves from the South were given passage to free states. 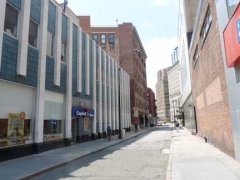 The houses were to be razed under eminent domain, but were saved by a public outcry. 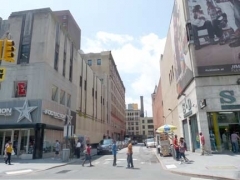 Though Gold Street has been confusingly called “Albee Square West” for a few decades, the actual “Albee Square” was historically a triangle formed by Fulton and Bond Streets and DeKalb Avenue. The first address on DeKalb for much of the 20th Century was the Albee Square Theater, named for Edward Franklin Albee, who partnered with B.F. Keith in a series of vaudeville theatres. The theater opened in 1925 and featured stage shows (at first) and first-run films until the mid-1970s. It was razed in 1978 with the Albee Square Mall, the centerpiece of the new Fulton Mall project, rising in its place. The mall, in turn, succumbed in the early 2000s, and the new City Point commercial/residential building is rising in its place. 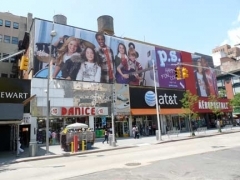 The domed Dime Savings Bank, now a Chase branch, is a seemingly indestructible Albee Square feature, as is Junior’s Restaurant, directly in back of it at the Flatbush Avenue Extension. 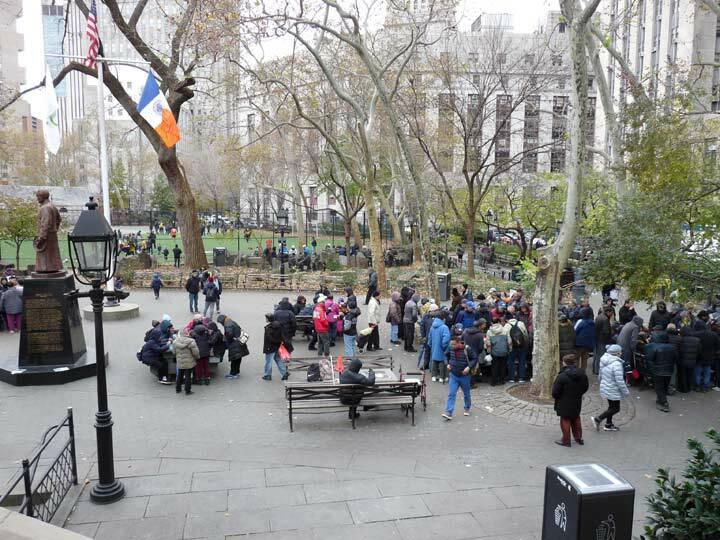 The new Albee Square Park is an unappetizing mix of grassy patches, concrete steps, metal tables and chairs that stay put via the honor system, and metallic subway grates.